It really is amazing how fast the year is going. All over reports of migration have been well underway and the quiet lull before the winter “storms” are upon us. A few weeks ago I saw a large group of about 15 or so NightHawks pass through. The gourd racks have been still and quiet for months now. I am waiting for the arrival of the neighborhood winter visitors with the usual boredom that ensues at this time of year. As fast as all my nesting birds have left it takes a while before the winter visitors arrive and the time in between draws out, agonizingly slow. What a great year it was. Looking at the calender, I find it hard to believe we are now in Autumn. All the roosts are done and the painful purple martin season that many had can now be called just a bad memory. We can all breathe a collective sigh of relief as our losses could have always been worse and our successes are always a gift from God. A very interesting find by Veronica G. a fellow PMCA forumite. 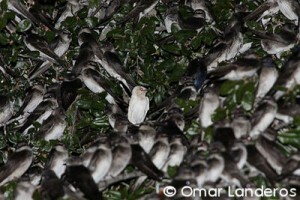 At the Tulsa, Oklahoma roost she spotted a leucistic purple martin. Check out the fabulous photos taken by Omar Landeros. Talk about finding a needle in a hay stack! These purple martins are absolutely stunning and though they are often times destined an early fate, sometimes they seem to adapt and be accepted. 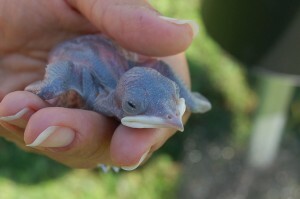 Here is a link to a tragic story, back in 2007, of 2 albino purple martins that fledged at Mr. Steve Kroenke colony in Logansport, Louisiana. 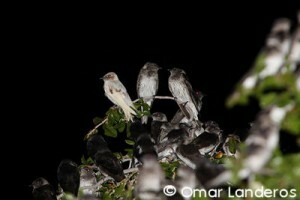 Some landlords have had leucistic purple martins return year after year and I rejoice for them. I hope this beauty returns safe and sound to his or her home in the spring. What is the difference between Albino and Leucistic? In short, an Albino lacks all pigment so that even the eyes appear pink, and beak and feet are “horn” colored. Leucistic birds have varying amounts of white feathers but still have the areas of “normal” pigmentation. Will these leucistic birds have leucistic babies? Usually not. Being a recessive trait the offspring may inherit the recessive gene but not exhibit it. It will only show in the offspring if one of the parents is leucistic and the other parent carries the recessive gene for it. Even then there is only a chance they will inherit the trait. Sometimes they only inherit the gene but appear normally colored. Cool, huh? Many thanks to Veronica and Omar for the great pictures. When you decide that an Aluminum Purple Martin Bird House is what you want and your wallet is the deciding factor, the Sunset Inn is hard to beat. Clean lines, large compartments and insulated roof make this house a great place for purple martins to raise a family. Though the quality craftsmanship is apparent, you would not think this house is made by the Amish. I suppose, due to my own ignorance, I always thought of the Amish as wood workers not so much Aluminum manufacturers. Made by the Amish it is and the attention to detail is outstanding. Am I partial to the Sunset Inn? Of course! I own one. But aside from my partiality, the Sunset Inn is a great little house for the money. Similar in design to the WatersEdge Suites houses ( by Coates) and the Safe Haven by Creative Universe Enterprises the Sunset Inn also features the larger sized compartments that most other aluminum houses lack. 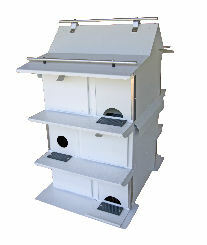 Most aluminum houses have tiny 6×6 inch compartments that are way to small for a 7 1/2 to 8 inch bird. Even the Purple Martin Conservation Association recommends the larger sizes even though most manufacturers have yet to adopt it as a standard. Most aluminum houses out there require making changes to and cutting aluminum to modify those tiny compartments. If you want a house designed for safety and increased survival rates “out of the box”, I suggest looking seriously at the Sunset Inn, Safe Haven or Watersedge Suites houses. The Sunset Inn can be purchased as a stand alone house to be mounted on a mounting plate on a pole or bought as a complete system which includes a pulley system to raise and lower the house. Though the 2 options look similar they are actually 2 different houses. Let me explain. The Sunset Inn System is wider from front to back to allow a central pole to come through the center portion of the house to the pulley assembly at the top of the pole. The stand alone Sunset Inn house is built without this space and the center wall is shared by the compartments on the front and back of the house. Depending on your budget and how you want to raise and lower the house you choose one option over the other. Their are several features that I really like about this little house. The 2 ventilation holes in the compartments are easily opened and a great size. In the hot Florida climate I keep both of these open and the cross ventilation helps with the heat. The porch has a strong aluminum bar on either side to give stability to the house but is also great to attach hardware cloth for added protection. Light weight the stand alone house weighs less than some plastic houses out there. This makes it super easy to raise and lower the house on your telescopic pole. A great price for an aluminum house it makes a good alternative for the budget conscience who would rather not go with a plastic house. Nothing is perfect in life and there are a few minor issues that we have come across. Though not deal breakers, you should be aware of these. The same great ventilation on the fronts of the compartments can allow driving rains to enter. This makes using the elevated subfloors an absolute must. The same great support rods that add stability to the house may also get in the way when removing nest trays, if you use them. FYI: The door panels must be slid to the side to remove. Though not nearly as bad as the Watersedge Suites Aluminum houses, the Starling Resistant Entrance Holes (SREH) are a tad higher than they should be. 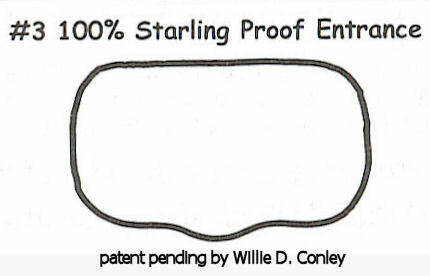 This can allow the occasional small starling to breech the entrance and enter the compartment. Though this house is great out of the box, there are some easy DIY modifications that I would suggest, to make it even better. Adding 2″x4″hardware cloth is something I recommend for almost all houses. It adds a measure of safety for the martins exiting the house during an Owl raid. Owls are known to flush out the martins and catch them as they flee their housing. Use the subfloors or create your own with very fine 1/8 inch hardware cloth is paramount to allow the nests to dry out quicker. Add perches. That also goes for every house. The Sunset Inn was compared to the only other similar houses on the market. The WatersEdge Suite and the Safe Haven. The WatersEdge Suites are manufactured by the company formerly known as Coates. 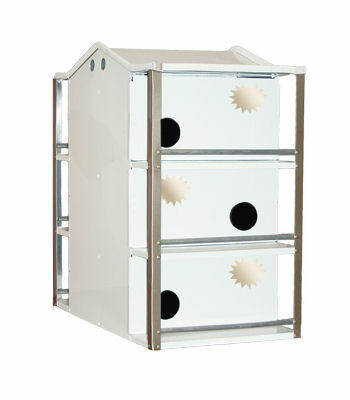 Their aluminum houses are readily available on many internet sites and are mass produced. The Safe Haven is produced by hand in limited quantity by a Creative Universe Enterprises who also manufacturers a well respected line of gourd racks. Price/Affordability: Though the price of the WatersEdge is slightly lower, there are several differences that make the Sunset Inn a superior house for the extra $25 or so dollars. The Safe Haven is far more expensive but has features that are superior to both the WatersEdge Suites and the Sunset Inn. Ventilation: The WatersEdge Suite does not have the adjustable ventilation holes that the Sunset Inn has nor does it have any insulation that both the Safe Haven and the Sunset Inn have. The Safe Haven has rain canopies on the exterior ventilation holes that make it virtually impossible for driving rains to enter and thicker foam insulation in the attic. The Sunset Inn has those great adjustable interior vent holes that are a great feature and some attic insulation. Water Intrusion: The Safe Haven, with its nest trays and rain guards make it extremely dry inside. The Sunset Inn and WatersEdge do have some water intrusion issues that make subfloors mandatory. Standard with the WatersEdge they are offered as an option with the Sunset Inn, which makes it an additional expense. Ease of Nest Checks: The Safe Haven again surpasses in the ease of nest checks with its optional nest trays that slide out completely and easily and doors that hinge downward. The Sunset Inn, due to the aluminum stability rods on the corners of the unit, make for some awkward moments in removing nest trays but the open inner area lets all the nestlings have plenty of room and the doors remove completely for great visibility. The WatersEdge with its inner entrance hole is in essence 2 compartments so no nest trays are commercially available. The WatersEdge further falls behind with its hinged doors that flip up which makes it further difficult to see in the nest when the door is lifted open. SREH: The WatersEdge fails miserably with its only option of crescent SREH that are located much higher than is recommended to prevent starlings from breaching the entrance holes. SREH should be as flush as possible to the bottom for maximum effectiveness. The Safe Haven easily out performs its competitors with its interchangeable entrance plates so that entrances can be changed in seconds and its traction grip that has a near flush access to the crescent openings. The Sunset Inn can be ordered with either crescent SREH or round openings. Design: The Safe Haven has tons of thought in its near flawless design and implementation. The Sunset Inn is far superior in details to the WatersEdge that comes in last, even though the WatersEdge can be purchased as a 4 or 8 compartment house. Quality/Durability: The Safe Haven is new to the purple martin market but seems like it is top notch in quality and durability. The Sunset Inn has a proven record and feels sturdy and strong for its small size. The WatersEdge feels slightly flimsy and easily comes in third. Raising/Lowering: Though all 3 come as stand alone houses, only the Sunset Inn is available as a Pulley System with its own pole and pulley system. For the beginner who wants a modern house that is easy to lift, it is hard to find fault with this great little house. The WatersEdge is only meant for a telescopic pole though all 3 can be mounted onto a multipurpose pole if easy lifting is desired. Over all, the Safe Haven is the winner if you have the financial resources and a multipurpose pole. A serious purple martin landlord such as myself views this house as the “creme de la creme” of martin houses. If money is a concern the Sunset Inn is a perfect choice for either mounting on a telescopic or multipurpose pole or if you are going to purchase this house as a system. The Sunset Inn System can accommodate 4 gourds underneath with the optional gourd brackets but still go up easy with its pulley. The WatersEdge comes across as a mass produced purple martin house. As with many things, mass production profit margins often win out over small details that make all the difference. Do plastic houses work? Sure and many purple martins raise families in plastic houses. For me, my first purple martin house (a plastic house) was an inexpensive way to discover that I really wanted to get into these birds and in short order I switched over to a gourd rack with a pulley system and an Aluminum martin house. (That I LOVE) I have not looked back yet. 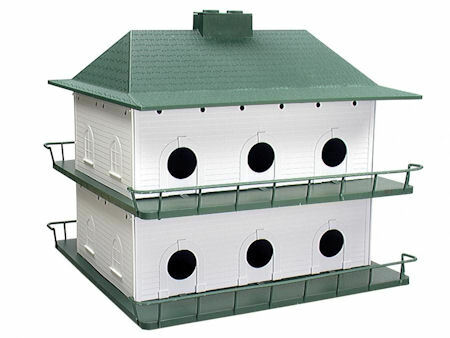 As a purple martin landlord myself, do I recommend plastic martin houses? Usually not. Many people shopping for a purple martin house turn towards plastic martin houses for 1 of 2 reasons. Reason #1 is Cost. Reason #2 is fear of internet shopping. Let me explain. I realize that purple martin houses can seem expensive to the purple martin newbie. 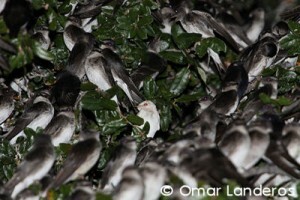 If your main concern is the cost of purple martin houses, take a few things into consideration. A basic wooden Bluebird nestbox at Walmart costs almost $30.00. It will only house one pair of Bluebirds. As you know, purple martins are colonial nesters and nest in the company of other purple martins. The price of a 6 room Sunset Inn Aluminum House costs $150.00. That comes out to $25.00 a compartment. Now I know the price of the pole is separate…as it would also be with a bluebird nestbox, but my point is, the cost pretty much equals out. Especially when you consider the extra added fun 5 more pairs of birds could ultimately provide. Now I know that a plastic bird house is a LOT cheaper. Heck the price for a COMPLETE plastic house set up with a pole is $145 at PurpleMartins-R-Us. That comes to about $12.00 per compartment, at first glance. BUT you have to factor in that those compartments need to be enlarged. SO now we are back down to 6 compartments. So that’s about $24.00 per compartment. AND factor in that the quality, longevity and other issues and that deal doesn’t seem like such a deal anymore. Trust me, I know how it is. You may be interested in getting into the hobby. But you want to touch the martin house you are going to buy. You want to hold the package and read what it says. You want to be able to look someone in the eye as you hand over your dough. I know, I know. That is the drawback of internet buying. Go into your local Lowe’s or Home Depot and all you will find are those plastic purple martin houses. Many of the high quality wood and aluminum purple martin bird houses available on the internet are NOT available in stores. The superstores buy thousands of product at a time. Higher quality martin houses are built by hand. Many of these houses are built by Amish companies and you couldn’t find them in a brick and mortar store if you tried. So when it comes to cost the old adage of getting “what you paid for” applies. Trust me, if the manufacturers of the plastic houses had a $200 product, they would charge it and if the wood and aluminum houses were not worth the money they cost, the people that make them would be out of a job. I don’t want folks to think I don’t make a habit of recommending plastic houses because I don’t sell many of them. I do sell martin houses on my website, PurpleMartins-R-Us.com but I usually recommend a higher quality house or gourds. For the most part, I try to stay away from the “plastic house” controversy. And believe me there is a huge controversy. When I read this post by Carole on her blog mtpleasant.homeschooljournal.net. I thought I would recommend her blog post as a read so that you can see other folks experiences with plastic martin houses. There are a few posts about the author’s purple martins and her changing from a plastic purple martin house to a wooden purple martin house. Reading her experiences will give you input on some of the drawbacks of plastic houses. If you are on the fence about what kind of purple martin house to get, just keep it in mind. 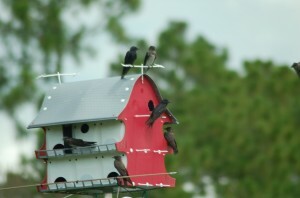 PurpleMartins-R-Us.com is owned and operated by active purple martin landlords. We are a specialty store that knows what works with purple martins because we host them every year. As always we are always here to help you with any questions that you may have about martins. Purple Martins are North America’s largest swallow and have been “helped” by man in their reproductive success longer than any other bird. Yet there is a lot of false information on the web designed to separate you from your hard earned dollar. Getting purple martins to nest in your backyard is often no easy feat but being an informed customer can increase your chances as well as save you money. Purple martin houses can be found in some super stores, home improvement stores and on-line; but do you even know what to look for? Doing some research now can save you time and money and save your new backyard neighbors lives. First remove the the wheat from the chaff. There are many websites that sell any number of purple martin houses but an on-line store does not an expert make. 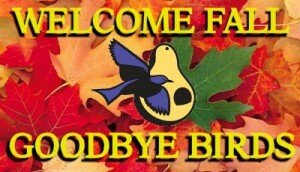 Many backyard bird supply stores are repeating decades old myths specifically designed to make them money. >>Purple martins eat mosquitoes. Nothing is more untrue. Purple martins do not eat mosquitoes. This myth was made up by a very successful purple martin house manufacturer to do nothing except sell houses. So if you are wanting to get purple martins in your backyard, don’t do it thinking that your mosquito problem will vanish. You would be much better off draining any sources of standing water than buying a bird house. According to the Purple Martin Conservation Association, studies have shown that in stomach content analysis, mosquitoes comprise less than 3% of a purple martins diet. One study showed no mosquitoes at all. The myth persist despite real scientific data for two reason, salesmen swear it is true and some purple martin housing manufacturers still place this information on the packaging of their products. Why? Because it sells product. >>If you build it, they will come. This is not necessarily the case. Purple martins are pretty picky about certain things so hanging a purple martin gourd under a tree won’t attract any martins. Purple martin housing placement is key. Several ground rules must be followed when it comes to putting up a house or gourds. Follow the rules and you have a chance. Don’t follow the rules and you have no chance at all. So if you have a heavily treed lot but the salesman wants to sell you a purple martin house, just say no. >>It’s OK to let sparrows or starlings nest in your purple martin house, since there are no purple martins in it this year. FALSE! Nothing can be more detrimental to your chances of ever getting purple martins to nest in your gourds or house than this. 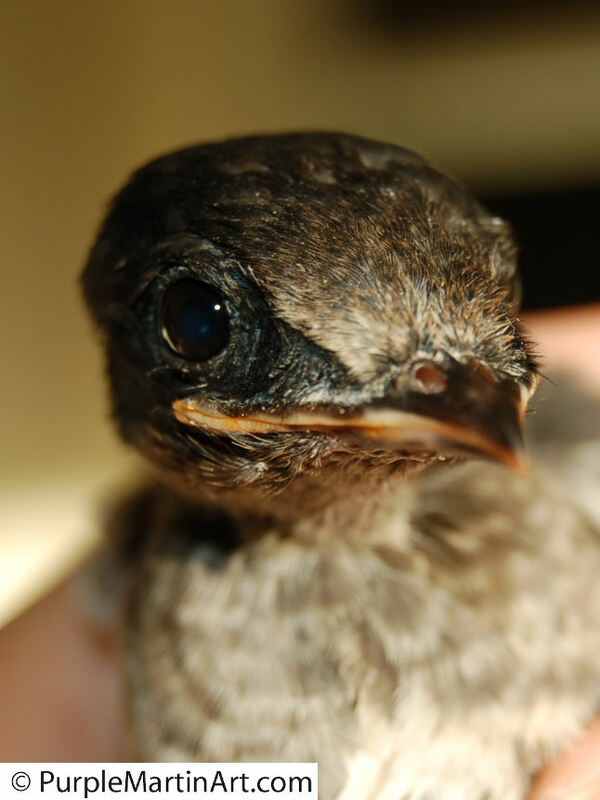 Purple martins are out-beaked by the invasive English House Sparrow and the European Starling which will pierce eggs, kill nestlings and even kill the adult purple martins. Many people get discouraged by not being able to attract purple martins immediately and allow the housing to be claimed by sparrows and starlings. Once this happens any investigating purple martins will be run off. Even if the purple martins are able to build a nest and lay eggs, the resident sparrows and starlings will enter the compartment and kill nestlings, toss out eggs or just poke holes in the eggs. This is how these birds operate. To decrease nest site competition they destroy other nests. >>The more compartments a house has, the better. Once again, NOT true. Though purple martin are colonial nesting birds (they like to be with other purple martins) a house that is poorly designed with lots of rooms, is still poorly designed. Once again a myth perpetrated by those pesky manufacturers, a purple martin house with 12 tiny rooms is not a better deal than a house with less rooms. The important factor is the size of the rooms. Both parents sleep in the nest at night along with an average of 5 nestlings. Purple martins are about 7 1/2 inches long. Now cram 7 birds into a tiny 6 inch compartment. Though purple martins will use substandard housing they only do so because there is no alternative. Birds sleeping in a tiny 6×6 inch nest are easy pickings for Owls and other opportunistic predators that will frequent your purple martins home. 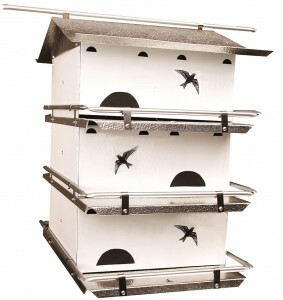 The new trend is 6×12 inch compartments that allow the purple martins room to grow and allow them to nest out of owls reach. >>Purple martin scouts are going to come back with friends. Purple martin scouts are not scouts at all. Competition for nesting spots is fierce and the early bird does get the worm, or in this case, the nest. Early spring arrivers are on a mission to return home and an occasional stop to check out your house is not out of the ordinary. But don’t think that these birds are going to fly back to tell their friends of your location. The most important things you can do to attract your own pair is make sure your housing is in the best location and don’t let any other birds nest in your purple martin housing. 4. Don’t set it and forget it. Good purple martin houses are designed for weekly nest checks and you can increase your purple martins reproductive success by being a hands on landlord. PurpleMartins-R-Us.com is owned and operated by an active purple martin landlord. Many of the items we sell we actually use in our own colony. We love our purple martins and if we don’t think the product is safe for the birds-we won’t sell it! Audubon Leaps into the Cats Indoors Fray! You see, it is NOT just me. 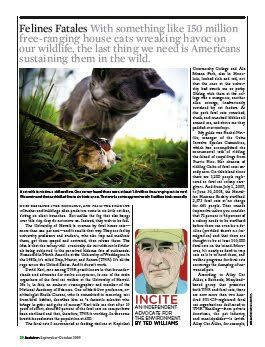 In a recent Audubon magazine article, Ted Williams points out the flaws, misconceptions and outright lies of the Trap, Neuter, Release (TNR) philosophy. But none the less these groups are strong vocal advocates for “Cats rights” and have blocked many efforts by birders to protect native endangered birds from free roaming and feral cats. I highly encourage you to read Mr.Williams Article and forward it to all you know. It is sobering information. And I can’t stress CatBibs enough. 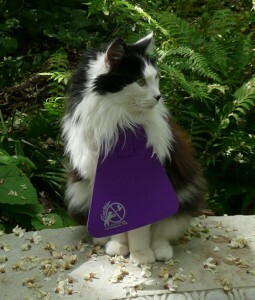 If you love your cats and love birds too please consider placing one of these harmless catbibs on your pet to save countless lives. You can read our previous post on the damage done by cats to our native wildlife HERE.